After a year of being upstaged by Japanese rival Infiniti and it�s hot-selling FM platform models (the G35 sedan & coupe and the uniquely styled FX SUV), not to mention the constant product rollout by Lexus, Honda�s upscale Acura division is getting back into the swing of things. After suffering a slight loss of �street-cred� with its Integra-replacing RSX, and watching as buyers switched from the aging TL to hot new-comers like the aforementioned Infiniti and the Lexus ES300/330, Acura has dropped its CL coupe and launched two new Accord-based models. A third, AWD, model is also in the pipeline. At the most affordable end of this new product rollout is the new TSX, which is essentially a rebadged version of the European Honda Accord. Aimed at the Audi A4 1.8T and BMW 325i, the TSX comes standard with a 6-speed manual transmission and a surprisingly responsive (for a naturally aspirated 4 cylinder, that is) 200hp engine. The only options on this compact sedan are the 5-speed automatic transmission and the DVD-based NAV system. Think of it as the spiritual successor to the old Integra 5-door, though Acura is selling every TSX is can build. 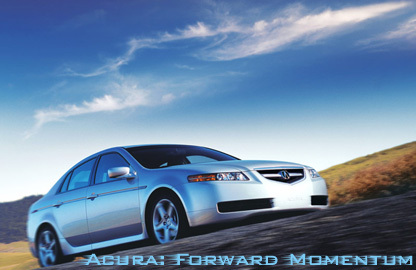 The single most important model to Acura�s sales figures is the TL. Like before, the new TL (seen above) is loaded to the hilt, now with such new features like Bluetooth hands-free link, DVD audio, XM Satellite Radio (in which Honda holds a financial interest) and an opulent interior with real aluminum trim and cool blue mood-lighting. The standard TL now comes with a 270hp 3.2L V6 with your choice of a 6-speed manual or 5-speed auto transmission. Previewed recently in concept form was a near-production version of the new RL. While details are still a bit fluid, expect Acura to be gunning for BMW�s 5 series and Mercedes� E-class. Key in their pursuit will be a new 3.5L V6 with around 300hp and mated to Honda�s new �Super Handling All Wheel Drive.� Expect all of the new TL�s tech goodies and more, like a NAV system that uses its XM Satellite Radio link to provide real-time traffic conditions and re-route you before you ever get stuck in the bumper-to-bumper stuff. Expect to see this technology in other cars within the near future. Since its launch a few years ago, the MDX SUV has been one vehicle that Acura has needed no help with selling. Last year�s sales were just a stone�s throw from 60,000 units, in fact. Still, rumors persist that a smaller Acura SUV is in the works, along with a redesigned MDX. But many analysts contend that Acura�s best asset, the fact that it is a Honda affiliate, may prove to hinder Acura�s growth as a luxury brand. Honda is known for economical front wheel drive vehicles, and it is still reluctant to develop the RWD platforms and V8 engines many believe are necessary to be taken seriously in the luxury field. Time will tell, however, if Honda�s brand of luxury can compete above the near-luxury segment. It would be interesting, though, to see Honda�s take on a V8 powered, RWD, midsize luxury sedan.